Ok, superbious is not a “real” word, but it’s a word that describes MacoLabels.com Laser labels and and Inkjet labels to a tee. If you need samples for proof, just give us a call and welll mail them out to you so you can find out for yourself. Turn your sketch into Computer Art with Inkscape. If you’re into free and useful stuff, you’ll love Inkscape. Also, if you’re an artist, and have a collection of your art that you’d like to turn into clip art or other computer art, look no further than Inkscape. Oh, and you’ll need a scanner. Almost every printer out there is a combo printer/scanner, so you should have a scanner or at least know somebody with a scanner. I then imported the image into Inkscape. Once you’ve mastered Inkscape, it’s a cinch to create great artwork for your shipping labels, full sheet labels and address labels. In Microsoft Word, when you’re putting graphics on labels like the ML-3000, and you want to duplicate it quickly, the most straightforward way to do that is by using the control key as you drag the item you need to copy. Select the graphic and hold the left mouse button down while holding the control key down at the same time, then simply move the graphic to the new desired position. This is done in lieu of copy and pasting. So to make copies of a graphic on an ML-3000, first do the copies across, then select the row of 3 graphics and do the drag copy downwards once. Then select the top two rows that you now have and drag copy them downwards, and so on and so forth. It takes no time to create a ton of nice templates. What a day in sports! The USA wins their game against Algeria 1-0, and win group C to stay alive in the FIFA World Cup. Then there was the all-day Tennis Match at Wimbeldon that lasted 10 hours, and continued into today with the American, Isner, winning the match. That is incredible staying power. How do you last that long? It’s kind of like our products, they’re made from quality materials that last a long time. For winning the NBA Champoinship. It was an exciting game, it was close most of the game with the Lakers winning 83-79. After winning, Ron Artest didn’t say he was going to Disney, and he didn’t thank God for the victory, but he did thank his psychiatrist. What the huh? Macolabels.com, champion of label sellers. If you don’t know anything about SVG, know this, it’s different than raster graphics, and stuff like bitmaps or jpgs or gifs. With SVG, you can zoom in on an SVG graphic without loss of detail. Ever try to stick a jpg graphic into a document and then resize it only to discover afterwards that the graphic has become pixellated, or fuzzy? With Inkscape (It’s FREE), you can make a little freehand drawing, then scan it, and convert it to an SVG and use the “Trace Bitmap” in the Path menu to convert the graphic into a path. Once that’s done, you can resize it without loss of detail. Check out what I did with this little decorative swirl for an ML-3000 in inkscape. Notice even when you zoom in on the SVG, the quality is still high. Yup, that’s what I said, “What’s Bloomsday?”. Well, people across the world come together to celebrate “Ulysses“, the James Joyce classic, and they call it Bloomsday after one of the characters, Leopold Bloom, and because the whole book takes place in one day on June 16, 1904. No, not that James Joyce. I’m gonna have to come up with some special days for labels. As a matter of fact, I’m gonna call June, ML-0600 month. The only reason I can think of making it ML-0600 month is because it has a 6 in it. 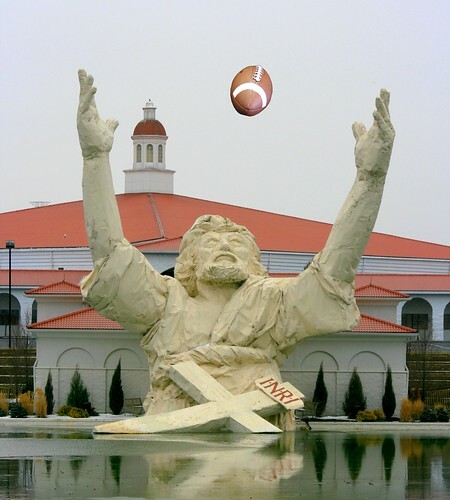 Touchdown Jesus has been destroyed. has been struck by lightning and burned to the ground. Lot’s of people thought it was made of stone, but no, it was made of flammable material. You know, when you make something, you’ve got to put quality first. That’s what we do at MacoLabels.com. We sell high quality labels at great prices. I can’t say what would happen if our labels were struck by lightning because we never made a giant Jesus out of labels. You are currently browsing the Macolabels's Blog blog archives for June, 2010.